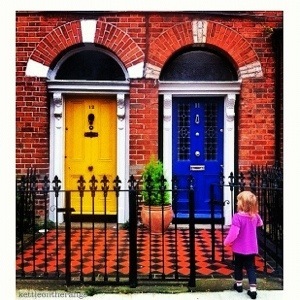 Victorian doors in Phibsborough, Dublin 7. I took this especially for my Instagram feed yesterday. And just look at those beautiful tiles. My daughter loves looking at the terraced red bricks in this area. She knows this was our neighbourhood for the first four months of her life. We lived nearby on Goldsmith Street, behind a door like these painted red. These two doors date from after the time that postal deliveries were first made to private homes (1845 onwards), so they come replete with their own letterboxes (it must have seemed like a violation for some to have to insert letterboxes into earlier, grand old Georgian doors that didn’t already have them). These doors have timber-hinged weather boards at the bottom, along with brass door knockers and large central brass door knobs, in keeping with the new Victorian mode for prominent door furniture. (I love that a door can have its own furniture). The fanlights above the door are fashionably plain, due to improvements in glass-work technology – earlier, more decorative fanlights of the Georgian era made use of multiple, small pieces of glass. The timber surrounds are of panelled pilasters with foliate scroll console brackets supporting the simple panelled frieze and cornice. This entry was posted in Kettle Thoughts and tagged Dublin architecture, Dublin doors, Victorian Doors, Victorian Dublin. Bookmark the permalink.